Rather than call this the 5 Best Zi Char in Singapore, these are 5 of my favourite ‘zhu chao’ places – each already very popular for their wok-fried dishes. Zi Char (or Cze Char) is the kind of food that can warm your heart, especially when you dine with your entire family and friends over dinner, each ordering their favourite dish of hor fun, kang kong and har cheong kai. My family used to order zi char only during special occasions, and we usually frequent Hillman and Pok Kee (which is sadly gone). I specially picked these 5 Zi Char places, also because they each have a stand-out signature dish, quite unseen anywhere or where others fail to replicate as well. 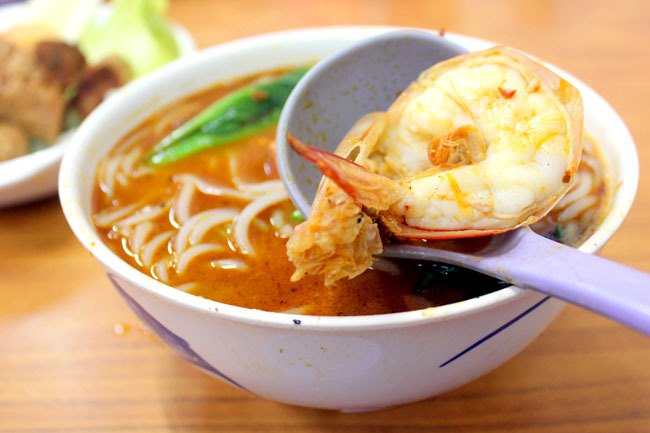 This Cantonese-style restaurant’s most famous dish is its Big Prawn Bee Hoon, costing a pricey $15 for a seemingly humble zi char place. Yes, 15 bucks for hae mee! But quoting L’Oreal, it is worth it, and I have been ordering it almost every single time I come. Every table orders the chao tar bee hoon (burnt vermicelli) at Yong Kee. This crispy vermicelli ($5) is a must try at Yong Kee located within a coffeeshop along Jalan Besar Road. You might have seen this dish before in Malaysia, but it is definitely uncommon here. The wait of 20 minutes was long, but it was worth every minute. Two Chefs describes themselves as “high class dishes at zi char prices”. Hmmm. The dish that everyone talks about is the Butter Pork Ribs ($8/$12/$16) which is pork chop (no ribs) covered with a specially made powdery butter. The pork cubes are indeed quite tender (can’t complain because I always get tough pork in Singapore), covered in this snowy white textured, sweet tasting butter power which takes four hours to prepare. It tastes like dried up condensed milk, while the traces of curry leave add a hint of fragrance. The dish used to be much better though, recently the power got clumpy. Keng Eng Kee is one of those Zi Char places that actually have good service (no grumpy aunties) – prompt (in fact too prompt my dishes arrived in minutes) and friendly. The originality of the dishes is quite mixed. Owner Mr Liew is Malaysian who learnt his craft from his Hainanese father-in-law, and serves mainly Cantonese styled dishes. 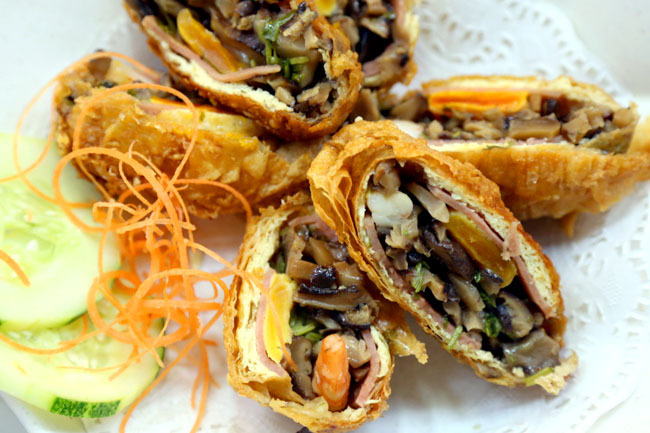 The eatery frequently introduce new dishes such as Thai style Claypot Chicken, and Royal Stew Pork Ribs, but it is the Mingzhu Roll ($9 for 6 pieces) that look overly elaborate and creative. It is fried tau pork stuffed with a variety of ingredients – salted egg yolk, prawn, ham, mushrooms and parsley served with a sweet cream sauce. Customers like to order the ‘Moonlight Horfun’ where an egg yolk is crack in the middle of wok-fried rice noodles. Service is almost atrocious but people still come in droves to queue during the weekends. After about an hour wait, we finally got a table. Quickly order the crabs because they may run out (yah, that sounds ridiculous for a crab place). For their Crab Bee Hoon served in claypot, I am prepared to overlook all the trouble. 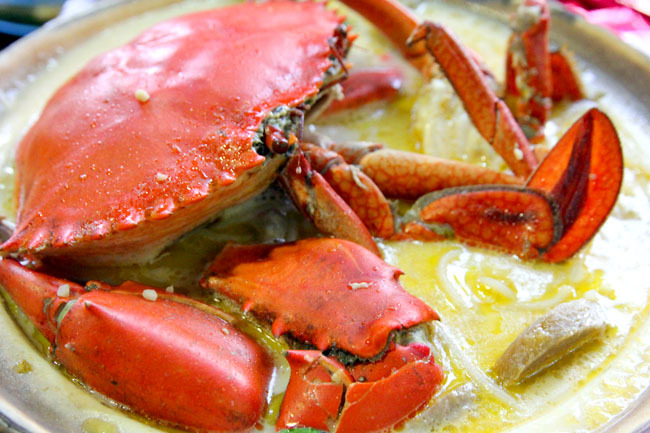 The soup is richly flavoursome with a multi-layered creamy taste, and that is also when you can savour the sweetness of the crab meat. 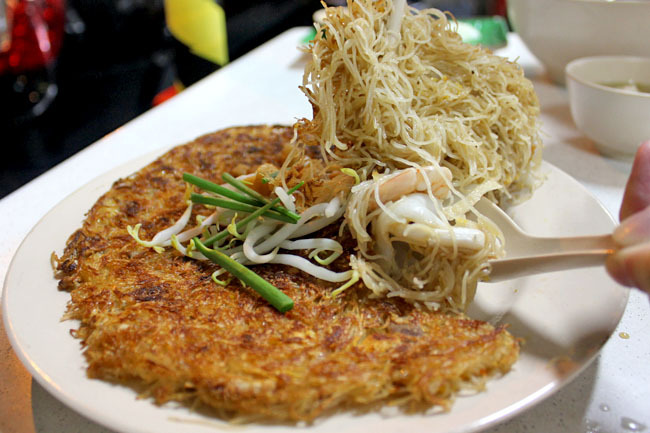 If you want more, just request to ‘jia tang’ – add beehoon with soup for a price without the crabs. 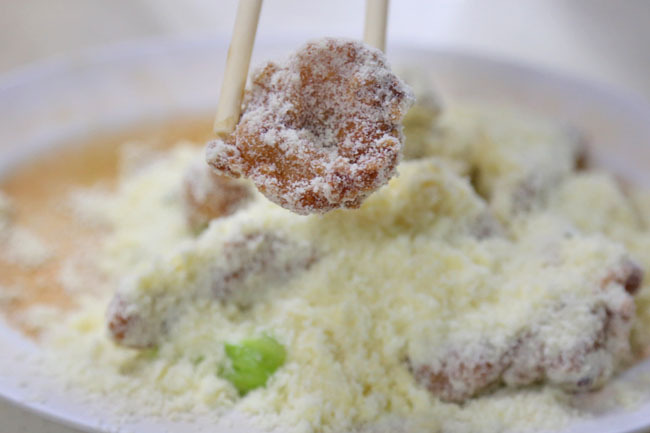 So what are some of your favourite zi char places and must-have signature dish? What Is Your Must Have Zi Char Dish? I read your above post and you mentioned u like por kee zhchar. Not too sure if it is the one famous for its champagne pork ribs. If it is, its now located at seng poh road. Near tiong bahru market. Hope you can reunite with your favourite zichar store. Hi Eason, didn’t Por Kee close down 2 months back? They were sold for $1.5 million (or thereabout). 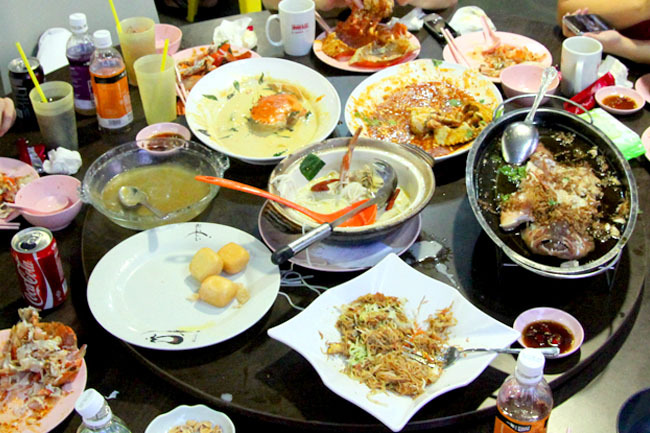 Have anyone tried Ah Pang Steamboat Seafood at 159 mei ling street? In my opinion it is one of the best hawker steamboat and cze char food stall in town. As a food enthuiastic, I’ved heard quite a lot of good review and recommending this popular hawker stall including my colleague. Finally, I took my family of five and visited Ah Pang Seafood Steamboat yesterday, myself n wife, parents and my 3 years old son. From what I know from the staff, the minimum set for 2 to 3 persons is $24, so I asked the waitress wats the standard set for 4, she said $30 and we told her it’s fine for a start. Though it was quite crowded at the time, I was surprised we have our steamboat set up and served approx. in about 10 mins. As I have seen a critics in regards to their service I was wandering will I be treated the same but instead I was quite surprise by their friendly and prompt service. Nevertheless, it is the food I am more interested in so let me share about it. Firstly the steamboat set for $30 we’re were given 5 set of dishes and a plate of vegetables. The five sets were. Fish slices set, one set of pork slices, Fish Maw set, one set of prawns, scallop set. The veggie set is chinese cabbage mixed with Tang oh veg And 2 eggs. if I want to order extra set, I was told that it will be $6 each. As we are not the fish maw lovers( actually fish maw is quite value for money though), I asked if I can change to others and the reply was I can change it to anything that we want From chicken,fish ball, beef, clams, sea cucumber and many others I couldnt remember. So finally I choosed to change to a set of fish ball for my kid. To be frank, all the ingredients looks fresh. I tasted the soup before the ingredients were put in and the taste is rich in flavor and yet not salty. It was hard to describe but I also taste sweetness in it but it blends very well altogether. After we put 50% of the ingredients in it and Bravo! The soup suddenly becomes incredibly tasty, like magic. One thing to mentioned about is the steamboat chille sause, definitely best choice for chiliie enthusiastic, cause it is really spicy, just that I personally felt that it is a bit more sour but my mum loves it. We spend about 1 and a half hour there enjoying the food and conversation, in between the stove runs out of portable gas and it was noticed by the staff and they got it changed quite fast. The replenishing of soup is quite prompt too. End of the day, I want to say, I have tried many steamboat in Singapore and Ah Pang steamboat is recently just added to one of the top of my list. Recommended!